Some fasts start out better than others; this one was not one of those. I fact it has been the roughest first five days of a fast that I think I ever have had. I have been terribly weaker than normal. Right after I finished my shower on Sunday, I felt very queasy and could not even dry off as I was about to pass out. I lay on the bed and got my bearings back only to have them wane away with every effort to stand up. I know what some people will say reading this: "See! Fasting is not good for you." I have been fasting for over twenty years and I never had this problem before...not ever. 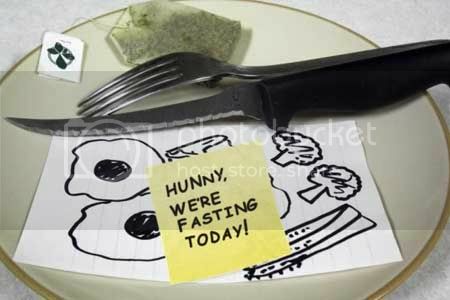 I have experienced and strongly believe that fasting is a natural healing remedy for all sorts of health issues. That is not to say that I have never been a bit lightheaded when going up steps or standing up quickly or generally weaker, but this problem was not like that at all. My husband brought me about four ounces of milk and within fifteen minutes I was fine again. I went to church without a problem...except that my right shoulder was very painful with certain movements and I did not even injure it, so I am not sure what that is all about. Perhaps an intense healing of something I have not recognized as a problem? It has happened before. I notice the difference later and think something like I guess that was bothering more than I thought. On the second night of this fast I began having insomnia, which is common for me usually when I have fasted for more than a week. I planned to have only tea, raw milk, and water for this fast, but I really needed to get my strength back up to make it through the week, so last night I had a bit more milk and took a few supplements: flax seed oil and fish oil hoping the Omega 3, a natural anti-inflammatory, would give me back the use of my arm; Vitamin D3 for better calcium absorption; and a Magnesium and Potassium mixture for the nighttime leg cramps that I also usually do not get this early in a fast. I woke up only once last night, which is quite normal for me even when I am not fasting, and went right back to sleep until morning. This morning I awoke up feeling great! So much more energy and that shoulder is just a bit sore. Good thing too, because I found out just this morning that my husband will be gone all week, so I have extra chores at home, besides the horse barn tomorrow. My husband was going to fast with me, but changed his mind and asked when I would end mine as he would like to continue my fast. This is something different. I am wondering how it will go as I was planning to fast at least a week to ten days, depending on the weight loss which is one purpose of my regular January fast. As to the spiritual part, I had some things to discuss with my Lord. Actually, I always do, so no fast goes without the spiritual aspect. Fasting is never fun--it just is not!--but when I wake up in the morning, I have no aches and pains that I typically had. You know, those things you just get used to having so you do not much notice them until they are gone. I feel so wonderfully pain-free, except that little reminder left in my right shoulder. I got to thinking about that; I irritated that shoulder by playing the Wii the week after Christmas and then it was better and I did not notice anything, but the fast is causing it to heal more deeply and properly I think. I had the same thing happen with a knee from a fall when skating some years ago. I had problems with it for a year and afterwards off and on for a few more, but not since the 40-day fast over a year ago. I wish I could give Dino some advice other than this: Once making the commitment to do anything whether it is fasting, doubling your tithe, or just doing some in service you end up disliking in dedication to the Lord, He sees and is honored, and honors the one who stay committed to his sacrifice. There is a good way to prepare for fasting and then there is just stop eating, which is not the best way for anyone new to fasting. The third day is usually the most difficult as that is when your body changes the pH balance in the digestive tract AND it begins detoxing. Some people can get rather ill during their first detox of any kind, but there are ways to prepare for a fast so that this is minimized somewhat. I was fine by day 3. It was the first too that were really rough ~ but although I'm not a heavy caffeine drinker I do start my day with a cup or two & so I was expecting the withdrawel headache. It was a wowser! I can get a headache with just a one-day fast, now and then, and caffeine is not a factor, although I do like sweet tea, usually watered down. Your dedication to fasting inspires me! I'd still like to read more about your fasting experiences. Thanks for sharing! Thank you for reading! It pleases me that you have an interest in fasting. Perhaps I will be reading about a fast on your blog one day. Julie, thank you so much. I am sorry I missed your comment until now. I just have not been online much lately. Being Truthful 366: What is Truth?